It seems that Raiden's new, high-speed romp through the world of Metal Gear has taken hold of everyone. Even the most critical ones found something to like about the adrenaline-pumping limb-slashing gameplay. 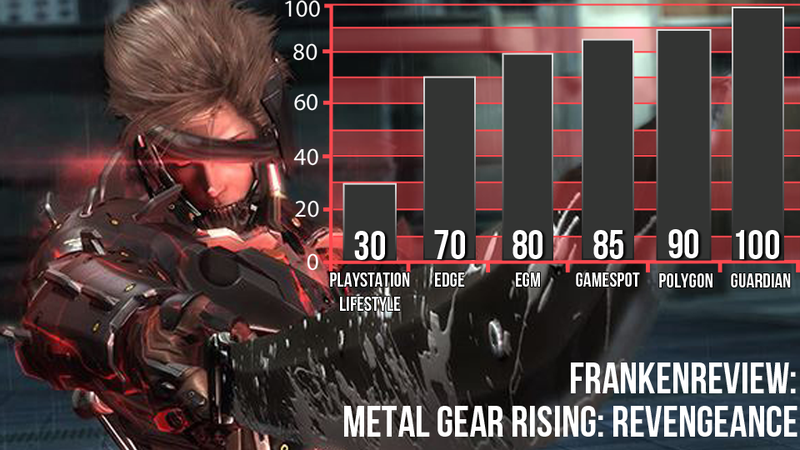 Metal Gear Rising: Revengeance gets praised for a lot of things. Some are utterly enamored with the swordplay. Others are delighted by the short, to-the-point and exciting cutscenes. Even more are happy to experience Metal Gear in a way they couldn't before. But what exactly do they have to say? Let's take a look. For every glimmer of excitement, there was an immediate let down. The one really great thing I can say about the game, is that I absolutely loved Zandatsu. Slowing down time to chop an enemy into pieces is wonderful 98% of the time. That other 2%, well, if you actually do play MGR, you'll see for yourself during a boss fight with Sundowner. During this slow-time Zandatsu, if you've weakened an enemy enough, a target will appear that you must aim and time a slice across to reveal their energy spines. Doing so replenishes Raiden's health and Zandatsu meter. I can see the potential here, but it's difficult to perform on larger enemies, so instead it just guarantees that every larger battle is accompanied by weak grunts spread everywhere so you have means to refuel yourself. None of it is enough to make up for the rest of the gameplay, though. Platinum is a victim of its own success: its games will forever be compared to Bayonetta, and that's a standard few can match, although it's one to which the studio should always aspire. But while Rising's combat is hugely satisfying to experiment with, and a sight to behold when played well, it's undermined by technical issues and a singleplayer campaign that peters out just as you think it's getting going. There's replay value here, and for Platinum's most devoted fans it won't matter if the game is five or 50 hours long, but others will, rightly, feel a little short-changed. One of the most impressive feats you'll immediately notice here is that, despite the shift from deliberate stealth-action to lightning-quick katana-based mayhem and a new developer, this truly feels like Metal Gear. All of the complex plot points, familiar sound effects, and even interminable Codec conversations with mad doctors babbling on about nanomachines (no, you haven't heard the last of that particular deus ex machina, Metal Gear fans!) are here. For those who prefer to take in a minimal amount of story, though, the cutscene lengths aren't too bad, particularly when compared to the overlong ridiculousness that was MGS4. It's a brief yet satisfying ride through a fast paced action game, and dozens of unlockable rewards continually entice you back into the fray. With addicting combat and a killer sense of style, it's unfortunate that the simplicity of Revengeance's underlying story fails to hit many high marks. Outside of a few memorable antagonists (Sam, for instance, is a sadistic delight), you won't walk away with fond memories of the overall plot, but Raiden's personal transformation reaches an atypical and invigorating conclusion. He's perfect for the role of the anti-hero, and through his transformation, Revengeance emerges as a fantastic action game set in the Metal Gear universe. The total emphasis on offense distinguishes Revengeance's combat from other character action titles. Underlining this is Blade Mode, a vicious conclusion to combat encounters that pulls the game camera in closely, slows down time and lets Raiden slice apart enemies freely from any angle. Blade Mode lets Raiden perform dozens of slashes in the span of mere seconds, climaxing with Raiden reaching into the carved body of his opponent and ripping out a glowing blue spine that instantly recharges his health. 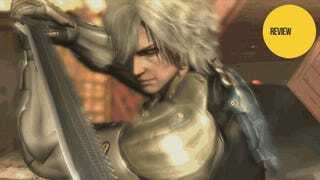 These executions are punctuated with a satisfying thunderclap as Raiden crushes the backbone of his foes. It happens hundreds of times throughout the game, but it's exciting every time. This swordplay is at the heart of the game's interactive toolkit. While running in his "Ninja Dash" (a high speed take on Assassin's Creed's one-touch parkour routine) Raiden will gracefully deflect incoming bullets with his blade, allowing him to streak up to any antagonising cybernetic soldier and engage in hand-to-hand martial combat. In close quarters, a squeeze of the left bumper sends Raiden into Blade Mode. Here time is slowed while your right thumbstick rotates a plane that passes through the centre of the screen. Release the thumbstick and Raiden performs a sword strike along its path. In this way its possible to slice and dice enemies (and many inanimate objects) while an on-screen "combat log" keeps track of the number of disparate "parts" that your handiwork has created. In order to temper its use, Blade Mode drains the Raiden suit's energy, which will replenish slowly or which can be refilled by attacking enemies—a design that naturally favours offensive play.